We’ve all been there. Stepping on the scale and holding our breath. Closing our eyes to delay, just for a moment, the number that awaits us. If you’re like me, you’ve tried every trick to make that dastardly old scale behave a little more nicely. You’ve shed shoes, pants, earrings, headbands-you’d take out your fillings if you could! And that does not even include all of the hard work that preceded this moment: the endless hours of exercise. The gallons upon gallons of water. The near starvation and the gagging down of all these pills, potions, and magic elixirs that promise instant and enduring results. By the time we reach the scale, we’re more likely to feel like crawling than walking-such is what we put ourselves through in the pursuit of the thin and perfect’ body. But why are we so obsessed with a few measly numbers on a bathroom scale? Why does this one little household item have so much power over us, and how we feel about ourselves? The simple fact is that the number on the bathroom scale reflects very little on our overall physical health. And it says far less about our beauty. Our uniqueness. Our worth as human beings. So instead of being taunted by the tyranny of the scale, let’s focus on the things that really mean something, the things that really matter. Let’s learn to treat our bodies right and recognize their beauty-at any weight. Anyone who has ever dieted-and that means pretty much anyone who has ever lived in the US in the last 100 years-knows how quickly an obsession with the scale can develop. Those first few lost pounds are like a drug. They intoxicate. They infuse you with a sense of accomplishment. Of triumph. But that victory is all too often short-lived. Soon the numbers start dropping gradually. Then they stop dropping at all and as the weight loss slows, the obsession with the scale grows. You may find yourself checking multiple times a day-maybe even multiple times an hour. You will find that your mood and your self-image are increasingly tied to the numbers that greet you on the scale. If the drop has been sufficient, your day is made and your self-esteem grows. If the drop is not what you expected then you are a failure. You have not worked hard enough. You did not want it enough. You are not good enough. This is a vicious and tremendously unhealthy cycle, one that often leads not only to emotional overeating in the desperate attempt to gain some kind of solace but one which also produces stress-and stress, as we know, causes chemicals such as cortisol to be released into the body. These stress chemicals also promote the development and the retention of fat, especially fat around the dreaded midsection. When you become scale-obsessed, you’re basically setting yourself up for failure, for a self-destructive cycle of emotional highs and lows that will almost inevitably lead to weight gain. 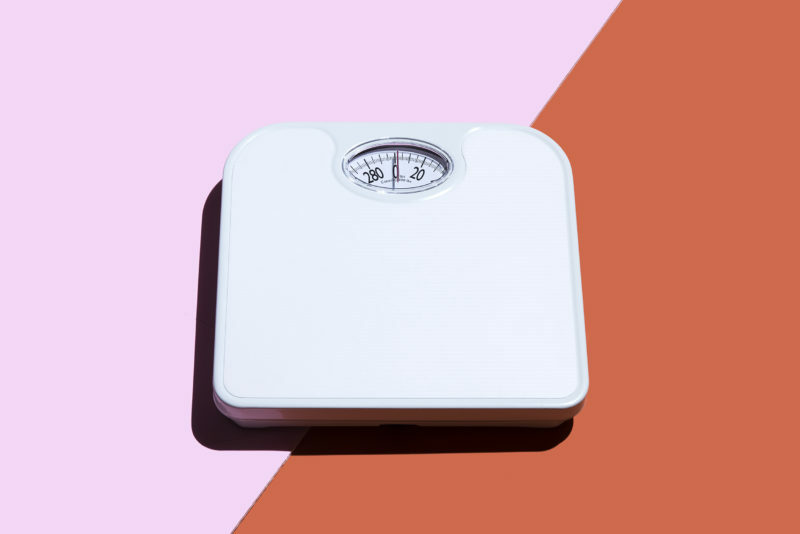 Scales Do Not Reflect Weight Loss Accurately An important issue to bear in mind is that the number on the scale does not actually reflect fat loss. In fact, most of the weight loss in the first stages of dieting is water loss. The reductions in salt and carbohydrate intake which often accompany dieting lead to very rapid loss of fluid retention. But the human body simply cannot shed fat that quickly. So the scale gives you a false sense of accomplishment in the early days of dieting, which then makes you so desperate to duplicate that “success’ that you and up making demands of your body that it cannot possibly fulfill. After all, the body can only lose so much water before the organs begin to fail completely. And true weight loss, by which we mean true fat loss, can only be accomplished gradually. This is a weight loss I best measured in inches, not in pounds. One of the most frustrating aspects of dieting is that what works like a charm for one person may not work at all for another. There are few things more upsetting than watching your friends and loved ones achieve amazing results when you are working so hard and getting little or nothing in return. It’s all too easy in cases like this to forget that no two people have the exact same metabolism. Each person metabolizes calories, nutrients, and energy differently and a myriad of factors can shape how our metabolism functions. Everything from age to gender to lifestyle to overall health can have an impact on our body’s metabolism. However, if all we are thinking about is the number on the scale, then we risk forgetting the vital role that metabolism plays in the success or failure of our diet regimen. Rather than obsessing on a number, it is far better to explore how our body is functioning and why. Metabolism is a key component in this. If what is working for others in your age group isn’t working for you, then it may be worthwhile to visit your doctor. You may learn that you have a vitamin deficiency, or a problem with your thyroid function, or some other issue that is affecting your metabolism, causing weight gain through no fault of your own. Recognizing the role of metabolism in weight loss is the first step on the road to better health. The reason for this is simple, you’re now beginning to appreciate the complexity and the true miracle-that your body is. Your body is far more sophisticated than three measly numbers on a scale. It deserves far greater respect than being distilled down to such a nothingness. When you begin to disassociate your weight from your self-worth, then it makes it easier to invest in treating your body right, no matter what effect that new, healthier regime might have on your weight. In fact, a number of components of a good health and fitness program can actually lead to an increase in weight, but that does not mean that your health is deteriorating or that fat loss is not occurring. The opposite could actually be true, you may be burning fat but gaining muscle, which is denser than adipose (fat) tissue and therefore weight more. So What Do You Do Once You Ditch the Scale? Eat Right, Once you stop worrying about the numbers on the scale, you can also start worrying less about the pesky issue of calories. Instead, you get to focus on more important matters when it comes to your food, such as its nutrient content. If you are eating right, your principal concern should be that your food is whole, rich in the micronutrients and macronutrients your body needs to perform at its peak. This also means eating lots of healthy fats, proteins, and complex carbohydrates-things which calorie and weight-conscious dieters may shy away from but which are essential to building, and maintaining, a healthy body. It’s nearly impossible to consume all of the nutrients the body needs in a single day simply through food intake alone. This is where turning to a good nutrition supplement can be a great idea. There are a number of safe and affordable nutrition supplements on the market today which can help to provide you with the nutrients you need to build muscle and loss fat. The important thing to remember when you begin using nutrition supplements is that you may not actually lose weight with some of these, but that does not mean you are failing in your health regimen. In fact, you are probably growing stronger, healthier, leaner, and more toned. This improved performance and increased sense of wellness are far better indicators of your body’s overall health than any number on the scale could ever be-and when you learn to value yourself, you will learn that health is a much greater gift than some arbitrary weight that the beauty industry claims you need to be. To be healthy, you not only have to eat right and take in the proper nutrients. You also have to be physically active. This doesn’t mean that you have to spend 10 hours a day in the gym, tortured by painful workouts that you hate from beginning to end. No, it’s far better to find a physical activity that you love, one that you feel excited about, one you can’t wait to get out and do. Maybe it’s salsa dancing. Maybe it’s biking in the mountains. Maybe it’s martial arts. Yes, you have to be active, but you also have to take time every day for stillness. Whether you prefer to meditate or to pray, or simply to sit quietly by your window or beneath your favorite shade tree, the health benefits of stillness are virtually limitless. Taking the time to be quiet-to do nothing, to let the mind and body rest-improves focus, boosts mood, builds energy, and reduces those stress hormones we talked about earlier. You know the ones that lead to weight gain and fat retention? OK We’re born alone and we usually die alone. But that doesn’t mean that we have to be alone in between. In fact, studies are increasingly showing that the more social you are, the healthier you are Loneliness leads to depression, stress, and anxiety: three big players not only in ill health in general, but in weight gain and obesity in particular. An active social life, with lots of time spent with friends and family, increases the likelihood that you will be more physically active. You will also likely have more support and more motivation in your efforts to maintain a healthy lifestyle. It’s almost impossible to be weight and beauty obsessed when you get out of your own head and into helping others. Nothing feeds the soul like helping those in need. So volunteer Feed the homeless. Counsel abused women. Mentor at-risk children. When you see how many people are suffering and when you recognize your own power to make a difference in this world-it really helps to put matters of weight and appearance into perspective. You may even find yourself eating healthy and staying active not because it’s going to look great in the next selfie, but because it allows you to help more-because you have people around you who are depending on you. You have people in your life to stay healthy for, to live (and live well) for. There’s no getting around it We live in a culture obsessed with youth and beauty. The explosion of social media and the 24/7 streaming of celebrity images has only magnified the pressure on women to live up to some false ideal of what is beautiful, of what is valuable, of what it is supposedly necessary for women to be. With the proliferation of mobile devices, we can’t even leave our homes to escape these images: we carry them around with us, day in and day out, on our cell phones and tablets. It’s no wonder that we fall so easily into weight-loss obsession when we are inundated with wasp-waist teenagers bombarding us with beauty tips and informing us with the latest weight loss secrets. Of course, we all know that these images are not real. The photo editing tools available on every device now puts old school Photoshop to shame. Everyday women can readily subject their selfies to massive touch-ups before releasing them to the world as their “true’ face, this does not even take into account the editing technologies used in the film and fashion industries. We all know these images are false. We all know that Giselle and Gigi do not look like “Giselle” and “Gigi.” But that all too often does not decrease the power of these images over most women’s lives. The obsession with the scale all too readily becomes the one tangible thing by which we can measure how close-or how far-we are getting from this supposed “ideal” of female beauty. We can break out of this cycle. We can move beyond the self-destructive pattern of trying to beat and badger our bodies into a mold that does not even exist in the real world. It is all a matter of what I like to call “extreme self(ie) care”. It means stepping away from the scale and into a way of living and thinking that recognizes and honors our bodies for the wonders of nature that they are, for the complex, powerful, irreplaceable temples in which we carry out the work of our heart and our souls. By doing the work of good health by eating right, by getting the proper nutrients, by being active and being still, by getting involved in the world we can escape this modern media captivity. We can discover our true faces and bodies. We can make our next selfie the picture of a face born of self-love, self-care, and self-respect. The selfie of the true self.